Why would I need self storage in Harvey, LA? There are a variety of reasons why you might need self-storage in Harvey, LA. How much is a storage unit in Harvey, LA? The cheapest storage unit in Harvey, LA is $51.00 per month. What size storage units do you have available in Harvey, LA? In Harvey, LA we have sizes that range from 5'x5' to 20'x30' to suit your storage needs. How much is it for a 5'x5' storage unit in Harvey, LA? The cheapest 5'x5' storage unit in Harvey, LA is $51.00 per month. Harvey is a small community in Jefferson Parish, Louisiana, situated on the West Bank of the Mississippi River and part of the New Orleans metropolitan area. It functions as a cozy suburb of New Orleans and has been a home to people for many centuries. In the early 16th century, French and Spanish explorers realized the economic and strategic potential of the area, and settlers quickly made us of its fertile soil and excellent access to the Mississippi River. Today, Harvey's close proximity to New Orleans makes it a desirable place for anyone who wants a suburban lifestyle within reach of major attractions and amenities. Unlike other parts of the country, where land is separated into counties, Louisiana uses its Spanish and French heritage to divide the area into parishes. Jefferson Parish was created in 1825 and named in honor of Thomas Jefferson for his role in purchasing the Louisiana Territory. At one time, Jefferson Parish was mostly a rural area filled with undeveloped land and dairy farms. However, as the population of New Orleans continued to grow, the area eventually became the first suburb west of the city. 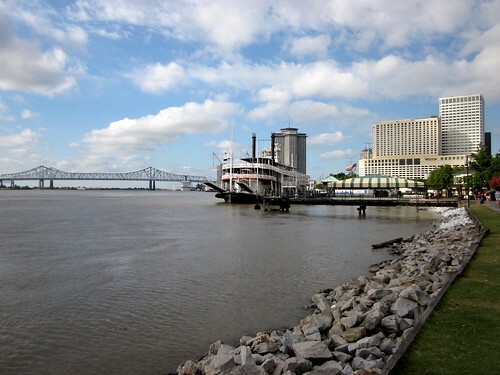 At one time, residents living in Harvey had a difficult time crossing the Mississippi River and accessing the East Bank and downtown New Orleans. However, in 1958, the Crescent City Connection opened its first span across the river. The second span was opened in 1988, and residents could easily travel across the Mississippi River. Today, reaching the East Bank is very easy, taking just a few minutes by car or public transit. On average, Harvey has a lower unemployment rate than many other cities across Louisiana. This is a good sign if you're planning to look for a job in the area. The greatest number of local jobs tend to be in the construction industry, followed closely by manufacturing, retail and hospitality. Because it offers such a diverse range of industries, Harvey is a good place for nearly anyone to find a job. If you can't find something that fits your needs in Harvey, you can easily travel to New Orleans for work. It's just four miles away and offers a large, diverse job market. Top employers in the New Orleans area include Ochsner Health System, Tulane University, Acme Truck Line and Al Copeland Investments. These four companies alone provide many thousands of local jobs. The Jefferson Parish Public School System serves the schools of Harvey. In addition to its traditional campuses, the school system also includes several charter and specialized schools. You can also find a few private schools within the small town. Utilities: Entergy Louisiana supplies electricity to Harvey, while natural gas is sourced from Atmos Energy. The Jefferson Parish Water Department oversees water and sewer services. Garbage and Recycling: As part of the Jefferson Parish, Harvey receives curbside collection services. Transportation: Jefferson Transit serves Harvey and the greater Jefferson Parish. On average, homes in Harvey are more affordable than those in many other Louisiana communities. They're also more budget-friendly than the homes in nearby New Orleans, even though the larger city is just a few miles away. There are many three- and four-bedroom homes throughout Harvey, as well as many smaller two-bedroom homes that are great starter homes. Our lowest priced units in Harvey, LA average $60.50 per month. 72 people have reserved units in Harvey, LA in the past 30 days. There are 2 locations within Harvey, LA's city limits. There is 1 location in Harvey, LA that offers AC and Heating features.